Perfect for adding a pop of color to a black sweater. Fold the scarf in half and drape around your neck with both of the ends hanging down your torso. Tie two of the end corners together in a knot and repeat for the other corners. You should now have a loop which you can bring up around your neck to complete the look. This style gives you the look of wearing a vest without creating additional bulk. Simply drape a long, medium width scarf over your shoulders, ends down your front, and buckle on a narrow belt of your choice over the ends. Long, narrow scarves are best for this braided look. Drape the scarf around your neck, and down your front. Tie a half knot and then braid the rest of the scarf. Tuck the ends under the loop around your neck. 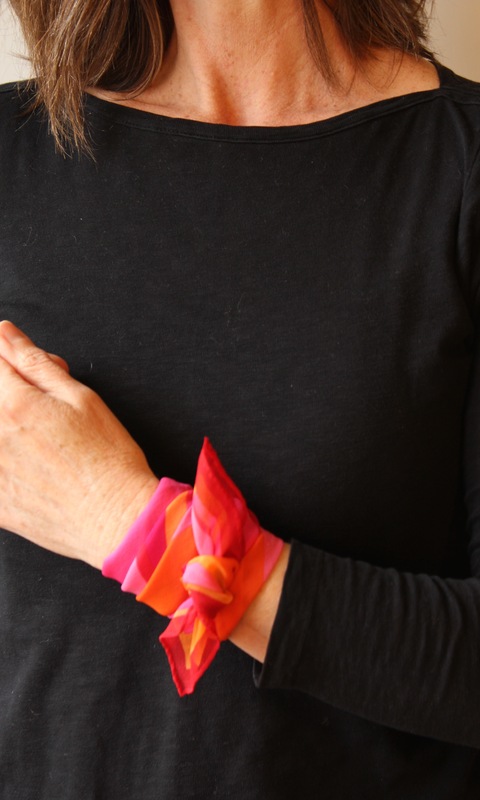 Your scarf can do double-duty as a bracelet when you wrap it around your wrist and tie it in place. This look works well for silk scarves. This option also keeps a scarf handy while you are on the go: If you end up in an unexpected downpour, you can quickly untie the scarf and use it to cover your hair. Scarves with metallic threads and accents can also make great necklaces. Tie the scarf in three knots, tie in the back and you have a scarf necklace that creates a beautiful frame for your face. Drape a larger scarf over your shoulders as you would a shawl. If the scarf is a large square, fold it on the diagonal before draping. This is a sophisticated look that keeps scarf ends out of your way while typing, working or just walking around town. Drape the scarf from your neck so that the ends hang down your front. Next, pull the right end over your left shoulder and do the same with the other side. Drape the scarf over your shoulders so that both ends rest on your torso. Cross the ends and tie them. Adjust as necessary to create a casual look. This variation on a wrap holds your scarf securely and creates the look of a shrug. Drape a large scarf that you’ve folded into a triable over your shoulders. Pull one end under each of your arms and tie them at your back. Double-up your scarf and drape it sideways over the back of your neck. Hold the ends together and pull them through the resulting loop on the other side. Whether you want to add a pop of color to an outfit, keep warm in the office, or bring a new lease of life to your wardrobe, scarves can do it all! Soft Surroundings has a range of scarves and toppers that will add flair to any look. Which style is your favorite?